מים , ماء , water. It doesn’t matter in which language you say it or where you find it, water scarcity transcends national borders in the Middle East and North Africa region. Water is more scarce in MENA countries than in any region around the globe; population growth, climate change, increasing demand, and declining supply are among several factors combining to rapidly increase the pressure on water resources. Frighteningly, fresh water availability and usage is expected to drop by 50% by the year 2050. This prospect has led to the grim threat of interstate “water wars” fueled by tensions over water insecurity. Despite seemingly dire circumstances, both diplomatic and technological solutions to the water problem exist in the Middle East. Amidst the threat that water shortages pose for sustainable agriculture, sanitation, and hydration, case studies in the Middle East demonstrate the viability of both cooperative and technological solutions to address this regional challenge. Intersectional analysis of diplomatic cooperation and technological advancement in the MENA region can provide solutions to managing scarce water resources in MENA, both at the domestic and regional levels. Water scarcity is not a new phenomenon in the Middle East. In fact, home to 6.3% of the world’s population and only 1.4% of the world’s renewable fresh water, trends in water scarcity can be reviewed as early as 1970 and studied in the context of population growth and urbanization factors. Population growth has exacerbated the water scarcity MENA faces. MENA’s population more than doubled between 1970 and 2001 from 173 million to 386 million inhabitants, reducing the average amount of fresh water available per capita by more than half, to 1,640 cubic meters per person per year. According to the UN Department of Economic and Social Affairs, countries dropping below 1,500 cubic meters of water per year per person are experiencing “water-stress”; countries below 1,000 cubic meters per capita are “water scarce”. 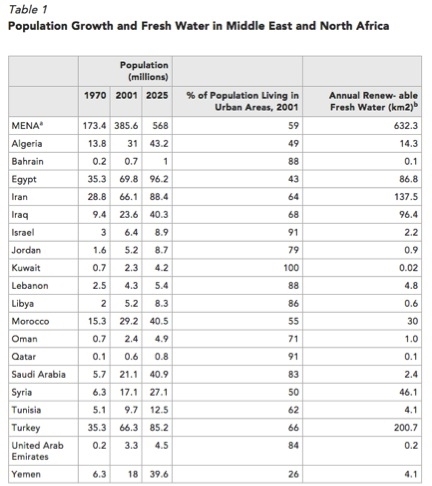 That said, 12 of the world’s 15 water-scarce countries are located in MENA (see Table 1 below). This is a concerning statistic for a region whose population is expected to reach 719.4 million by 2050. The high rate of urbanization in MENA countries is another contributing factor to water scarcity in the region. By 2001, nearly 60% of all inhabitants in MENA countries were living in urban areas. 9 of the 19 countries listed here (right) have more than three-quarters of their populations concentrated in cities. While it may be that higher population densities lead to greater investment in cost-efficient water management solutions, people who live in cities also tend to use more water than people in rural lands. As such, rapid urbanization in the MENA region can impede the development of important water infrastructures (e.g. sewage systems, distribution pipelines). While population growth and increased urbanization in the MENA region will likely reveal their devastating effects in the long term, the more immediate sense of urgency involves water shortages exacerbating regional conflicts where tensions are already high in the Middle East. “Water wars” occur when water insecurity causes conflicts of varying intensity and scale. Water wars manifest through intrastate conflict (e.g. as seen between various actors in drought-stricken Somalia, and in the case of North and South Yemen) or in a more interstate/regional context (e.g. tension between Iraq and Syria over control of the Euphrates River, and between Iraq and Turkey over control of the Tigris). Although these conflicts may appear localized, they present challenges to the broader context of peace and security. Just look at the path of the Islamic State in their control of major dams and cities along the Tigris and Euphrates - this takeover measured by waterways is testament to the fact that water, geographically speaking, has always enabled the true security of the region. Despite these seemingly grim facts, we shouldn't underestimate the power of technology and diplomacy; the thirst may be real, but so are the solutions. Region-wide investment and collaboration in water practices and technologies have the potential to address the challenges that water shortages pose for sustainable agriculture, sanitation, and hydration. Furthermore, cooperation between MENA countries has the potential to reduce tensions and armed conflict in the region. An analysis of various case studies in the Middle East can demonstrate the viability of both diplomatic and technological solutions and can inform policymakers in the MENA states about managing scarce water resources. In February 2014, the Food and Agricultural Organization of the United Nations convened the 32nd annual FAO Regional Conference for the Near East, in Rome. Relevant discussion focused on the Regional Water Scarcity Initiative launched between the governments of Egypt, Jordan, Morocco, Oman, Tunisia, and Yemen. The overall goal of the initiative is to support these countries in identifying and sharing best policies and practices in agricultural water management. By forming a regional collaborative strategy and building broad partnerships to support the initiative's implementation, the countries have accessed significant information about boosting agricultural productivity, improving food stability, and sustaining water resources. Prior to the Regional Water Scarcity Initiative, representatives from various MENA states gathered in May of 2012 for the US-Islamic World Forum hosted in Doha. One component of the conference was a workshop convened by the Stimson Center titled “Water Challenges and Cooperative Response in the Middle East and North Africa.” Participants included scientists, academics, policy analysts, and practitioners from several MENA countries, the U.S., and Europe. Working group recommendations involved prioritizing conservation and demand management (especially in the agricultural sector), mitigating unchecked groundwater pumping, pursuing research and development in desalination and waste-water reuse, and building awareness of the impacts of increasingly water-intensive lifestyles. As is demonstrated in both of these instances, interstate cooperation involves the “prospect for policy innovation, mutual capacity-building, sharing of data and best practices, and joint bench-marking and standard setting” (Brookings, 2012). In parallel with diplomatic progress toward combating the water shortages, the private sector has developed key technologies to combat the very same problems. The Israeli water technology sector is particularly geared towards developing efficient water conservation methods, and water renewal techniques. For example, in 2008 the company TaKaDu began designing computer software that uses mathematical algorithms to prevent and detect leaks in water pipelines. Utilities worldwide tend to lose, on average, 30% of the water they distribute due to leaky pipelines, but in Israel where companies employ TaKaDu technologies, water loss is no more than 10%. In addition, certain water renewal technologies focus on desalination of seawater and the reuse of treated sewage for agriculture. Desalination, the process of removing salt/minerals from saline water and transforming it into safely consumable water, is widely practiced in Israel where 25% of all drinking and usable water uses this technique. The Sorek desalination plant in Rishon Letzion pumps 150 million cubic meters of water per year and is currently approved to expand to 300 million at the same rate (in the world, the largest of its kind). By 2050 when fresh water availability and usage is expected to drop by 50%, the country’s water supply will consist of 70% desalinated seawater! In neighboring Jordan, engineers have similarly championed the treatment of waste-water. At the As-Samra Wastewater Treatment Plant (WWTP), the facility treats an average flow of 267,000 cubic meters of water on a daily basis. The recycled water serves a population of about 2.2 million inhabitants living in the Greater Amman and Zarqa areas. Through collaboration with European partners and a grant from USAID, the WWTP is the largest in Jordan. The King Talal Dam provides irrigation water for the Jordan Valley, however the water from the Zarqa river is typically polluted. The creation of the As-Samra WWTP helped relieve environmental and health concerns, and continues to provide safe irrigation water for the Jordan Valley. Innovative developments are making their way out of the gulf as well. In Riyadh, the works have been put in place for a solar-powered water desalination plant in Khafji with a production capacity of 60,000 cubic meters per day. An agreement signed between the King Abdulaziz City for Science and Technology (KACST) and the Advance Water Technology Company (AWTC) will provide for the application of “advanced nanotechnology techniques in the production of solar energy systems and membranes for water desalination.” Water desalination is an expensive undertaking due to highenergy consumption, but with innovative solar-powered plants, the Saudis will reduce energy costs providing an sustainable water source for the Kingdom. Moving forward, countries in the MENA region only have two options for their future. Their policymakers can ignore the signals that changing demographics and increasing urbanization have on the stability of water resources in the region. They will sustain the increasing financial cost of limited water supply, will be unable to maintain their agricultural outputs, and will face conflict with their neighbors or from within. On the other hand, policymakers in MENA countries can get serious by initiating state-to-state interactions and advancing their technical operations. They will be able to combat the threat of water scarcity by prioritizing mutual-capacity building, joint standard setting, and sharing best practices for water conservation and renewal. The thirst is real, but the rains are coming.